Q: What is an interactive notebook? 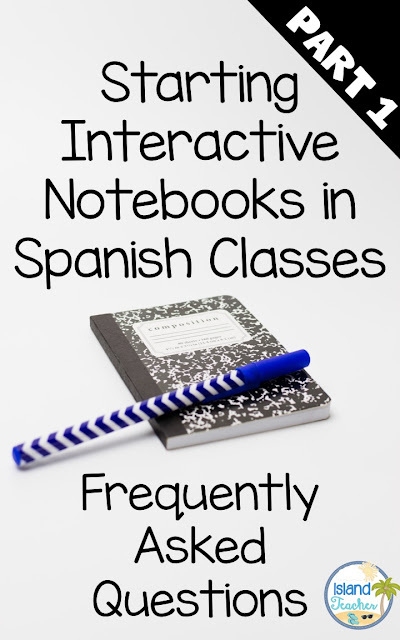 A: You'll get varied answers on this and my own definition will probably continue to evolve, but, at this point, an interactive notebook in my Spanish class is a notebook with which students can literally "interact" in order to learn a concept. I give input (generally via PowerPoint notes) to students and then the students "respond" in some sort of manner. It is NOT just a notebook with worksheets glued inside. It generally includes some sort flipable or foldable template, flip book, graphic organizer or a hands-on activity which is added directly to the notebook. Q: What do I need for INBs? A: I recommend the black (or any color cover) composition books. You can choose to have students add a cover to the composition. I have several cover choices (along with some sample templates) posted for FREE in my TpT store HERE. I find you're less likely to lose pages with a composition notebook than if you were using spiral notebooks. You also need scissors and glue sticks (or glue) for each student. I know that some teachers prefer glue over glue sticks, but I used glue sticks and never had a problem with things coming un-glued. In my opinion, there's less mess potential using glue sticks. Students also have colored pencils and highlighters to use with the notebooks. Q: How do you organize your notebook? A: I print a blank table of contents template for my students and have them attach this to the inside front cover of their notebooks. Students then number the pages of their notebooks (front and back). This all happens before we do anything else with the notebook. Each time we begin a new page, we title the page and add the title and corresponding page number to the table of contents. I am a stickler for having students keep up with the table of contents. It makes accessing previously learned info much easier as I can quickly tell them to go to page ____ for an explanation to their question. Some teachers like to follow a format of left side/right side for teacher input/student output. I may get there someday, but right now, I'm not nearly organized enough for that. Just being honest with you guys. ;) We just keep going on whatever page we leave off on. Inside the back cover we glue a rubric. More on this below. :) Last year, we began our notebooks, with a 5 Reasons to Study Spanish Assignment. You can see more about that HERE. I will definitely use that one again. Q: How do you assess your notebook? A: I will sometimes grade individual pages or activities within the notebook as daily or homework grades. At the end of each quarter, I collect notebooks and they receive a notebook grade (which assesses things like completeness, accurate table of contents, effort, etc. using a rubric). This grade counts as a quiz grade each quarter. 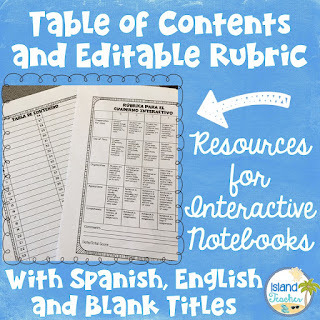 Click the picture below to link to the table of contents and editable rubric that I use to set up and organize my notebooks that available in my TpT store. 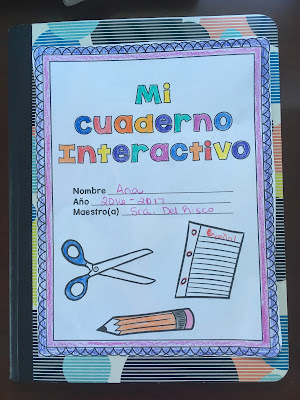 Stay tuned for Part 2 on Starting Interactive Notebooks in Spanish Classes. I'll have that posted later this week. In that post I'll talk about what goes in the notebook (and what doesn't) and how these have helped my students. I am captivated by the idea of an interactive notebook! I'm so happy I came across your blog on facebook! I recently purchased the Mega Bundle from your TpT store (well, the purchase order has yet to go through), but I'm excited to try it out with my 8th grade exploratory class this year. Do you have a rubric for grading that you would be willing to share or that I can purchase on TpT? Thank you for the great ideas and resources! Thank you! I know what you mean about the time issue--same here! I still like trying out new things, though, like the INB. Any other helpful resources you recommend for a newbie? This sounds amazing! Would you recommend it for a first level high school class? Hi there! I teach at a Montessori Charter School. I teach 1st-6th grade for 20-30 minutes each class/grade level once a week. I will be adding 7th grade this year, but I will have them for an hour every day for a quarter. So much time! I actually found you because of your 30 minutes class structure blog post. I just purchased your bundle on TPT and I am super excited to start exploring and planning with it. Thank you for sharing your insights and experiences! Thank you for your kind comments! I'm sure you'll find an hour/day will seem much longer! BUT, I think you'll be thrilled with the amount of progress you'll make compared to the once a week schedule. I grew up as a Montessori child (my mom directed a Montessori school for years)...while I've never been trained myself in Montessori methods, I think a lot of my framework in curriculum design comes from that background and my own schooling as a child. I'm a huge fan of hands-on materials (hence my love of INBs)! I hope you find it super helpful in your class! Hi! The inb looks very useful! I'm wondering if it has been successfully used with students above the grade 8 level? I've personally used my INBs for students all the way through Grade 10. Hope that helps!